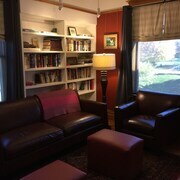 Situated in Iowa City, this hotel is within a 15-minute walk of Iowa City Public Library and Mercy Hospital. University of Iowa is 1.1 mi (1.8 km) away. Loved the pool and slide for the kids! Also the fridge and microwave in the room. I enjoyed the beds and our room was quiet despite being located next to the pool which was a bonus for us. We didn’t hear the train at all which was a concern as being from the area I know that it’s a fairly used train track. It was a nice way to celebrate our son’s birthday. Where to find Iowa City hotels near an airport? Where can I find hotels in Iowa City that are near tourist attractions? Hotel options are plentiful in Iowa City. Spend some time looking through Expedia's 25 accommodation listings, which are all within a 0.1-kilometre (0.06-mile) radius of Iowa City's center. 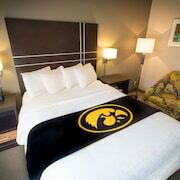 Visitors keen to sleep centrally in Iowa City, should check out the latest deals at the hotelVetro and Sheraton Iowa City Hotel. 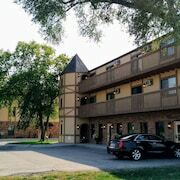 The Clarion Hotel Highlander Conference Center is conveniently located 5 kilometres (3 miles) from the downtown area of Iowa City and is an ideal option for visitors who like to save money wherever possible. 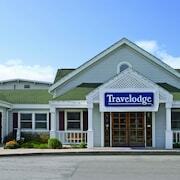 The Travelodge Iowa City is an alternative cost-effective option in this area. 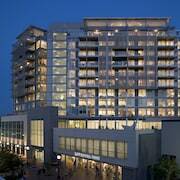 3 kilometres (2 miles) away from the middle of Iowa City, is the Coralville Marriott Hotel & Conference Center. The Radisson Hotel & Conference Center Coralville - Iowa City is situated 4 kilometres (2 miles) away. Two more options are the The Hotel at Kirkwood Center and the Homewood Suites by Hilton Coralville - Iowa River Landing. For those keen to see more of the rural landscapes that are a big feature in this part of the world, you might also spend a few nights in other destinations in Eastern Iowa. You can travel to regional various sights or enjoy snowboarding and skiing and afterwards book a comfortable place to stay. Williamsburg is 3 kilometres (2 miles) to the northwest of Iowa City. While here, take the time to explore the Coral Ridge Mall. Coralville accommodations include the Holiday Inn Express Coralville and Comfort Suites Coralville. Alternatively, you'll find Williamsburg, 40 kilometres (24 miles) to the west of Iowa City. In Williamsburg, take the time explore the Tanger Outlets. 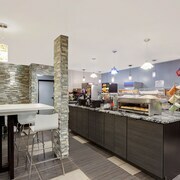 Accommodation options in Williamsburg include the Best Inn Cozy House & Suites and Days Inn Williamsburg. Just because you're on vacation, doesn't mean you can't indulge in your passion for sporting events. I Wireless Center is situated 85 kilometres (54 miles) to the east of Iowa City. Sports fans wanting to stay close by can take their choice from the Stoney Creek Hotel & Conference Center Quad Cities or the Radisson On John Deere Commons-Moline. Eastern Iowa Airport can be found 30 kilometres (18 miles) away from Iowa City. If you wish to stay nearby, you can easily secure a room at the Country Inn & Suites By Carlson, Cedar Rapids Airport, IA or AmericInn Lodge & Suites Cedar Rapids - Airport. What are the most popular Iowa City hotels? 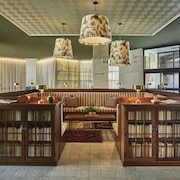 Are there hotels in other cities near Iowa City? What other types of accommodations are available in Iowa City? Explore Iowa City with Expedia.ca’s Travel Guides to find the best flights, cars, holiday packages and more!